Puzzle Hero by Genimo.com Arcade, is a puzzle-RPG (role playing game) that let player defeats more than 50 mystical 3D monsters, while charges through picturesque environments. The task for the gamer including saving the kidnapped brother, Tristan, from sorcerer Zalock’s spell and his Army of Darkness. In the game, player also has to outwit the puzzle and battle the mystical monsters that guard the road to Kingdom of Fog. He or she can increase the power by gathering gold and using it to shop for magical amulets, amazing selection of weaponry, armor, and clothing accessories. Here’s the video clip of preview of Puzzle Hero game play. 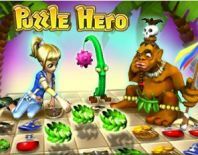 Puzzle Hero is normally selling for $19.95, but for today (June 29, 2008) is available for free as part of the promotion of Game.Giveawayoftheday.com. To get the free game, simply download the free version setup installer, PuzzleHero.zip (resource no longer available), and install the game by the end of today. Then use the following registration key to register and activate the full version product. The registration name and license key can be saved and backed up for future use, such as to re-install when reformatting hard disk or reinstall Windows. To do so, simply download the setup installer for Puzzle Hero from genimo.com (defunct), and use the registration key to unlock full version of the game. It works also for gamers who miss the dateline to install within today.